In the Six of Swords we can see a boat that offers enough room for its three occupants, A man, woman and child. The man has taken charge of the boat while the woman and child sit hunched over on the bench seat just in front of him. The woman seems oblivious to her surroundings and appears unresponsive or engaging. The man stands tall and strong and has the body of one who is young and healthy. We get the sense that this man is here to help and can be relied upon to safely deliver his passengers to the other side. The woman and child do not have to do this on their own. There is a great difference between the water at the right hand (starboard) side and left hand (port) side of the boat for it tells much about the meaning of this card. Choppy and turbulent waters rocks the right hand side of the boat while on the left hand side, the water is still and serene. The choppy waters belong to the shoreline we stand on, the shoreline that this boat is attempting to steer away from. Risking life and limb, the three people have managed to escape from struggle. Afraid to speak or call out to each other, the man helped the woman and child to board the unstable little boat before leaping aboard himself. His first task was to steer the little boat away from the shoreline and cross over to a new destination, the land and shore in the distance. He must keep the boat balanced and afloat if they are ever going to make it. They have not yet reached their destination. Anything can happen in between. Behind them in the distance, dark clouds gather over the retreating shoreline while huge waves crash against the rocks and cliff face. Looking back down at the little boat and his two vulnerable passengers he wonders how they made it. Had they been crazy to take such a risk? He doesn’t need to think too long about the answer to that for he knows that they had no choice. In the Six of Swords we see a woman and a child in the boat also resemble the two down and out Figures we saw in the Five of Pentacles. They too had found themselves in desperate circumstances and in need of help. 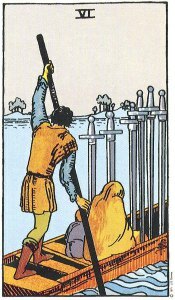 We hope that like the two in the Six of Swords they also found someone to guide them out of their situation. By the time she reaches the far shore she should have gained a new perspective on her situation and feel a little more positive and stable. Slowly but surely she can begin to pick up the pieces of her life. Her ability to cope and function will return bit by bit and lift her out of this depressed state. You may be slowly returning to work after a period of illness or unemployment. Business wise, you are coming out of difficulties and you can hardly keep your head out of water. You may be eventually clearing debts and bills slowly. This Card also suggests a career on the water. Travelling overseas to secure a position. In a Tarot reading the Six of Swords suggest that you are leaving behind a turbulent time in your relationship. Recovery and healing is not going to happen overnight though. Progress will be slow but steady after separation or divorce court litigation. On another hand, the Six of Swords may highlight that you have a tendency to run from relationships at the first sign of trouble or conflict. Instead of confronting the situation through communication and compromise you pack your bags and flee. Moving On, Slow Healing, Progress but slow, Shelter From The Storm, A Situation Calming Down, Overcoming Difficulties, Mental Relief, Feeling Defeated, Carrying Negative Attitudes or Beliefs, Pulling Back, Getting Out, Distance, Running Away, Making an Escape.